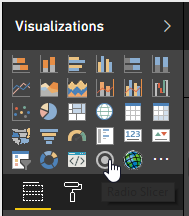 Starting with version 1.5 of the Power BI Custom Visuals SDK, we now have the ability to create “slicer” visuals, which are visuals that can filter data in other visuals on the same report. See my How to Get Started with Power BI Custom Visuals for general custom visual development tutorials. Here’s what this custom visual will look like when you are done with this tutorial. You can use Power BI Desktop, Excel, Streaming Datasets, SQL or whatever you prefer. I’ve provided an excel spreadsheet here that you can use. Just import it into Power BI using the web interface, or use Power BI Desktop and Publish it to the web. If you have no idea what pbiviz new means, then see my How to Get Started with Power BI Custom Visuals for general custom visual development tutorials. Open this folder in VS Code or your preferred IDE. Open capabilities.json and add replace its contents with the following json. Adds the “General->filter” format property which allows this visual to participate in filtering capabilities. 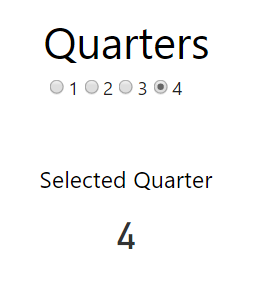 Adds a “top” number so we get the max categories allowed by Power BI. Right now that number is 30k categories max, but I set to 100000 for fun. The meat of the visual lives in visual.ts. Rather than explain each piece individually, I’m including the full code file below with bullets that describe what is going on. 3. Loop through categories and create a “selectionId” for each of them. SelectionIds are objects that you pass to the SelectionManager’s select method. It contains the metadata needed to filter. 4. Loop through each value and inject a new radio button into the DOM for each value. 5. Add an onclick event handler to each radio button that grabs the matching selectionId, selects it and then calls applySelectionFilter(). Note: You can only filter on categories, not values, and you are limited to 30k categories. Run the following command to package the visual and share it as a pbiviz file. Hopefully this post helps you get started building slicer visuals.